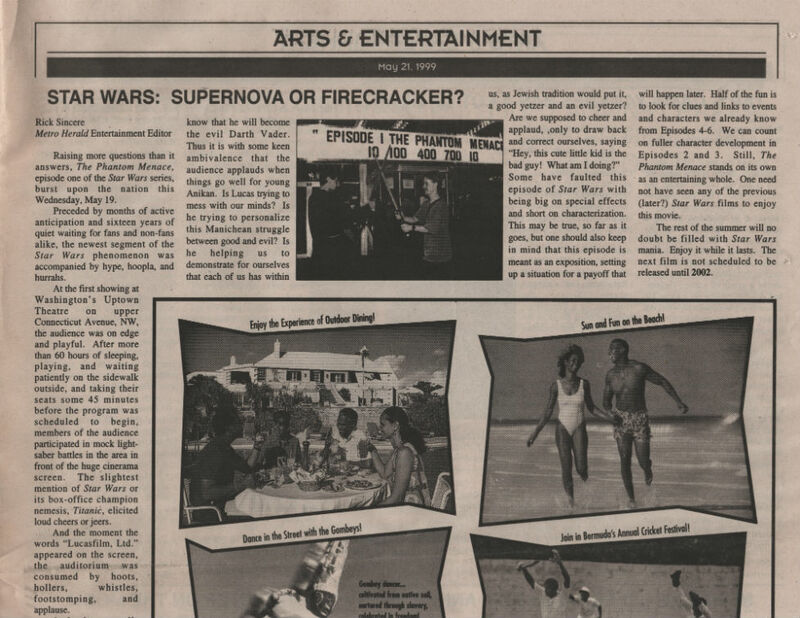 Searching through the archives, I found this article from 17 years ago, the same day that my review of Star Wars Episode I: The Phantom Menace was published. One of the great things about community theatre is that, when the cast is having fun on stage, the audience knows it. The sense of delight – and, yes, community – imparted by amateurs having a good time is infectious. While the Washington area is blessed with numerous top-notch professional and semi-professional theatres, there is something refreshing about seeing a group of actors, singers, and dancers putting on a show for the sheer joy of it, without worrying about the next audition, next paycheck, or the next job waiting tables. Thus it is with the Arlington Players’ current production of Damn Yankees at the Thomas Jefferson Community Theatre. It may be true that not every step is in place, not every not is hit just so, and not every line is delivered with equal panache – but the energy and enthusiasm of the cast and enthusiasm of the cast and crew shines through and overcomes any “amateurism” in the pejorative sense. This sensibility even comes through in the sound of the community theatre (and also the high school theatre) orchestra, which has a certain raw, rough-edged sound that, while never being exactly “off,” still lacks the pristine precision of a professional ensemble. This lack of polish is not a flaw; instead, it is endearing. Perhaps it is this hearkening to a simpler time that allows the cast to relax and enjoy themselves as they recreate the material on stage. All the performers put their all into their roles. You can almost see them licking their lips in satisfaction after a number ends successfully. Of the principals, perhaps Chuck Dluhy is the most perfectly cast as Mr. Applegate, the devil who comes to Washington. Dluhy’s slinky performance reminds us of Bob Fosse as the snake in The Little Prince, and how appropriate can that be? After all, the original Damn Yankees was choreographed by Fosse, and there are echoes of his style in Dykton’s dances. Unfortunately, despite the enthusiasm of the chorus, the choreography here is much better conceived than it is executed. Dluhy is well-matched with Kathryn Fuller as Lola, the vamp who used to be “the ugliest woman in Providence, Rhode Island.” Fuller’s height contrasted with Dluhy’s diminutive stature turns them into a Mutt-n-Jeff team that works remarkably well. And the red and black costumes designed for the pair by Susan Chong are delightfully devilish. If there is any problem in casting, it is, unfortunately, in Darrin J. Friedman’s Joe Hardy. He seems weaker than he should be, and this manifests itself the moment Friedman appears on stage, taking up the song “Goodbye, Old Girl,” where his older alter ego, Joe Boyd (Jim Golterman) leaves off, Friedman turns out to have a lighter voice than Golterman, when the opposite should be true. Boyd should have a voice that sounds worn, while Hardy should be booming. That’s not the case here. Much of the rest of the show relies on good, strong ensemble work, and Dykton squeezes that out of his cast to good effect. It is difficult to pick out the stand-outs, but special message should be made of Kerry DeMatteis as Rocky, Christopher Smith as Vernon, Matt Steffens as Strane, Steve Gluckman as Mickey, and Wyatt Fenner in multiple supporting roles. Damn Yankees has a number of wonderful, tuneful songs, including “You’ve Gotta Have Heart,” “Whatever Lola Wants,” “A Man Doesn’t Know What He Has,” and the comic baseball song, “The Game.” It also has what is perhaps the most clearly superfluous song in all of musical theatre, “Who’s Got the Pain,” a mambo number that was obviously designed to give Gwen Verdon (the original Lola) a chance to show off her special talents. It serves no other purpose. If you want to have a good time and escape into the arms of a strong community of players, then go see Damn Yankees. Damn Yankees continues through May 29 at the Thomas Jefferson Community Theatre, 125 South Old Glebe Road in Arlington (near the intersection of Route 50 and Glebe Road). Performances are Friday-Sunday, 8:00 PM, with a matinee this Sunday, May 23, 2:30 PM. Tickets are $12 for adults and $10 for seniors and juniors (18 or younger). For reservations, call the Arlington Players, 703/549-1063, or visit the TAP Website at http://www.come.to/the_arlington_players. For the record, the current web site of The Arlington Players is http://www.thearlingtonplayers.org/. Damn Yankees was written by Richard Adler and Jerry Ross (music), Richard Adler and Jerry Ross (lyrics), Douglass Wallop and George Abbott (book; based on Wallop's novel The Year the Yankees Lost the Pennant). The original production was directed by George Abbott. I have been publishing this and other blogs for more than eleven years, in addition to contributing to Examiner.com, Bearing Drift, and the Richmond Times-Dispatch op-ed page over that period. I've spent countless hours discussing politics as a guest commentator (and guest host) on local radio and TV programs. Throughout that time, I have refrained from endorsing candidates for public office at any level. To be fair, I have written nice things about candidates I like and snarky things about candidates I dislike, but I have never issued an explicit endorsement. This year, that changes. This year, the stakes are too high. In 2016, with Hillary Clinton on the left and Donald Trump on the alt-right, I am morally bound to oppose them both. Yet I am not content to vote for the least of three (or four) evils. Instead, I can enthusiastically endorse the most qualified of any of the candidates for president who will appear on the ballots of all 50 states plus the District of Columbia. The letter below was released earlier today on Facebook. I felt compelled to write it because of the risk that my fellow Libertarians may grasp defeat and despair from the jaws of opportunity and success. Governor Gary Johnson represents the best hope for a Libertarian ascendancy in the 45-year history of the party. Gary Johnson will have my vote in Orlando on May 29, and my vote in Virginia on November 8. I urge my compatriots in the LPVA to do the same at the convention next weekend, and my fellow citizens to do the same in the general election. I am firm in my support of Governor Gary Johnson and endorse him for the Libertarian Party’s presidential nomination without reservation. To be honest, I have known Governor Johnson for six years and he is the warmest, most unassuming politician I've ever met - - and I've met many, including every Virginia governor since Chuck Robb and nearly every candidate for Virginia statewide office since at least 2001. He is also among the most intelligent and thoughtful people I know. You can't ignore the unprecedented flood of positive media attention that Gary has induced. Polls show him winning vote percentages in the double digits, on the cusp of an invitation to the debates this fall, with the minimum potential of doubling or tripling the LP's record-high totals of 2012. If any other candidate wins the nomination on May 29, all of that will be dust in the wind, and the party's presidential vote totals will descend to Michael Badnarik - - or worse, Dave Bergland - - levels. The added advantages of drawing new and energetic members into the party, bringing libertarian ideas to a wider audience, and changing the terms of the country’s policy discussions are incalculable. Disaffected Republicans who vow #NeverTrump will not cast their votes for another erratic businessman with no political foundation, nor for a never-elected neophyte with a thin résumé. They are looking for someone with solid credentials and a proven track record. Similarly, disaffected Democrats who prefer Bernie Sanders’ misdirected idealism to a Clinton dynasty will find Gary’s clear vision of fiscal prudence and social progress compelling. Gary Johnson is a credible, pragmatic, experienced chief executive with a libertarian core. I can't imagine a better combination as the LP's standard bearer or as President of the United States. I hope to see many of my readers in Orlando and I look forward to a vigorous, civil debate about the nominations and the issues. An obscure 1951 film that fell out of copyright gained some new life in the home video market simply because a then practically unknown Marilyn Monroe had a small supporting role. DVDs of Home Town Story, written and directed by Arthur Pierson, are sold with big photos of Monroe on the cover, as though it is a “Marilyn Monroe movie.” It isn’t, but even if a few thousand people are induced to buy it for that reason, that’s a good thing, because the film has an important lesson about business and economics. The actual marquee star of the movie (which runs a short 61 minutes, more like a TV teleplay than a feature film) is Jeffrey Lynn, who plays Blake Washburn, a small-town newspaper publisher who has just lost his seat in the state senate to the scion of a local manufacturer, John McFarland (played by veteran character actor Donald Crisp). Monroe plays a secretary at the newspaper and appears on screen for no more than five minutes. Washburn is bitter about his campaign loss and, when he takes over the newspaper from his uncle, he embarks on an editorial crusade against big business, in particular railing against the profits made by large industrial corporations. His sometime foil in this is reporter Slim Haskins (played by Alan Hale, Jr., best known as the Skipper on Gilligan’s Island), who tells his boss to tone down the rhetoric. While I watched Home Town Story, I initially thought this would be a typical left-wing agitprop piece from the early Cold War era, where the crusading newspaper editor would be the hero and the capitalist businessman would be the villain. WASHBURN: What do you mean? McFARLAND: As I say, it’s my own private little pet theory. It’s very simple, not very complicated. You see, I’m not an economist, I’m just a businessman. I have to make a profit to stay in business. WASHBURN: Sure, we all know that. McFARLAND: I make a profit on every electric motor I sell but the customer must make a larger profit, because if he doesn’t, he won’t buy my motors and I’m out of business. WASHBURN (incredulous): The customer must make a profit? McFARLAND: That’s right … Yes, the customer must make a profit. For example, you have some typesetting machines out there. The manufacturer who sold them made a profit on them. But your paper would never have bought them in the first place if they couldn’t deliver something beyond their original cost. They must continue to work for your paper to be worth more to you than you paid for them. As a customer, that’s your profit. McFARLAND: Yes, you sell your newspaper to a man for five cents. He gets news, advertisements, and all kinds of information for his home and business. He gets service beyond the value of his five cents. As a customer, that’s his profit. The same story for everything else: the light bulb, the refrigerator, the telephone. For this, we pay a few dollars a month. Our profits are enormous in steps alone. In case of an emergency, it’s value can’t be estimated. SLIM HASKINS: That’s a different slant from what we’ve been printing. WASHBURN, after a long pause: As you say, that’s just a theory. But you can’t deny that you are a big business. McFARLAND: In your editorials, you’ve been insisting that because a thing is big, it’s bad. It takes bigness to do big things. Our industries turned out equipment for our armed forces in a remarkably short space of time. It was a big job and it was well done. It helped us to win the war and preserve our country. That’s what American industry with its bigness was able to accomplish. Was that bad, Blake? The last fifty years, we’ve come a long way. It used to take a week to get a letter across the United States. Now we do it in one day. The difference in time alone could affect the happiness of a family. It might even mean a matter of life and death. In my time, I’ve seen advances in industry that have added twenty years to the average span of life. My father died in the old country at the age of forty, an old man. His work was absolute drudgery, slavery, on his own farm from five o’clock in the morning until eight o’clock at night. But because I live in America, I feel like a young man, and I’ll be 65 in April. WASHBURN, irked: Why are you telling me all this? McFARLAND: Well, I thought perhaps you might be interested in both sides of this profit question, and print something else for a change. WASHBURN, steaming: Mr. McFarland, I don’t tell you how to run your plant, so please don’t tell me how to run my paper. I’ll print my own conception of business profits. Good day, sir. McFARLAND: Well, I just thought I’d come in and talk – which I have. Remember, Blake, when this country was first discovered, there was nothing here. Now look around you, everything you see is profits. Our transportation, communication, household appliances, medical equipment. Notice them sometime, Blake. They’re the real profits. As a result, Washburn’s next editorial has a different approach. Curious about the writer and director of Home Town Story, and wondering where he might have come up with the ideas that inspired the film, I did a bit of research. Arthur Pierson only directed two other feature films. Most of his work was in television, and he ended his career as an executive at Hanna-Barbera, the animation company best known for producing The Flintstones and The Jetsons. Something early in Pierson’s career stood out, however. It turns out before he became a director and screenwriter, he was an actor. Between 1929 and 1940, he appeared in eleven Broadway plays. In fact, in 1935, he was in the original Broadway cast of The Night of January 16th, written by Ayn Rand. Now, you don’t suppose that Arthur Pierson, Hollywood director, got some of his ideas about business and profits from the Goddess of the Market herself, do you? 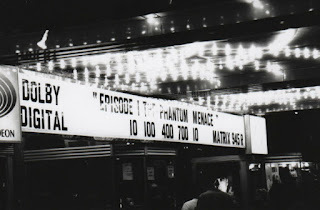 As I noted in my previous post, 17 years ago this month, I was one of hundreds of Star Wars fans who camped out in front of the Uptown Theatre in Washington, D.C., to be among the first to buy tickets and then to nab the best seats to see the long-awaited prequel to the epic trilogy, Episode 1: The Phantom Menace. While my first report for The Metro Herald described the spontaneous community that emerged along the Connecticut Avenue sidewalks, my second report was a sort-of review of The Phantom Menace. 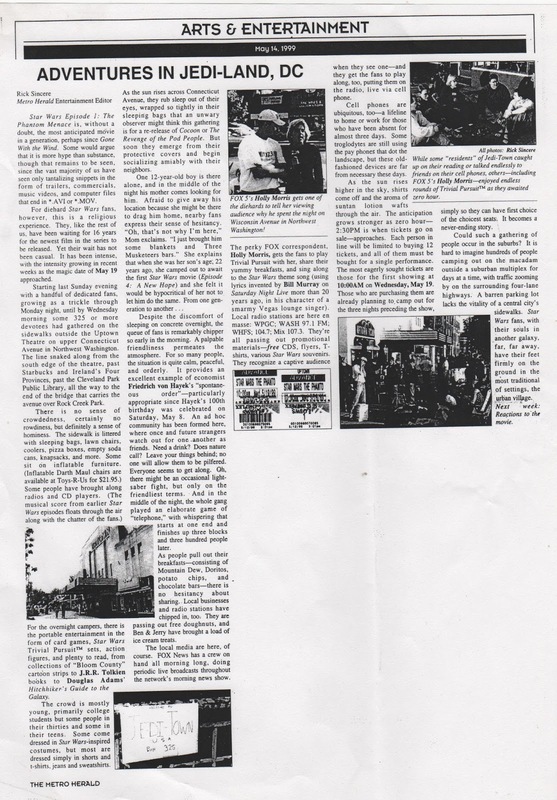 I just found this article in my archives and had not read it in many years. The biggest surprise to me? Not a single mention, positive or negative, of Jar-Jar Binks. 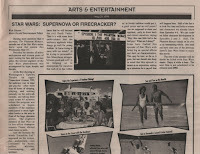 Star Wars: Supernova or Firecracker? Raising more questions than it answers, The Phantom Menace, episode one of the Star Wars series, burst upon the nation this Wednesday, May 19. Preceded by months of active anticipation and sixteen years of quiet waiting for fans and non-fans alike, the newest segment of the Star Wars phenomenon was accompanied by hype, hoopla, and hurrahs. 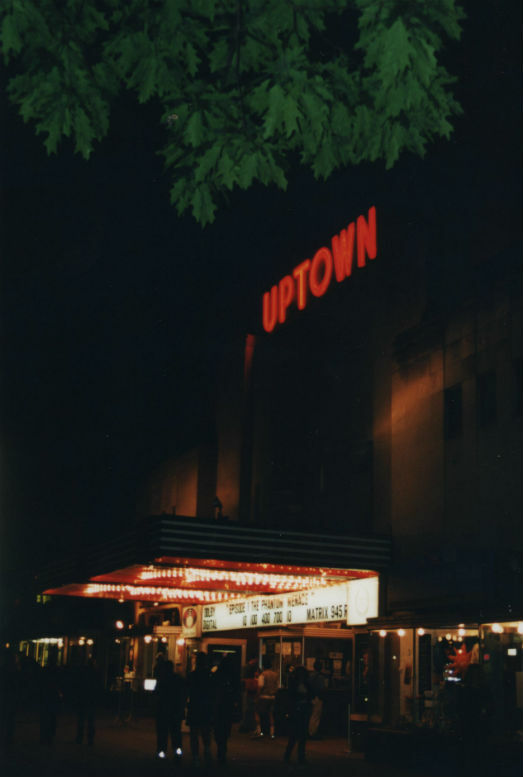 At the first showing at Washington’s Uptown Theatre on upper Connecticut Avenue, NW, the audience was on edge and playful. 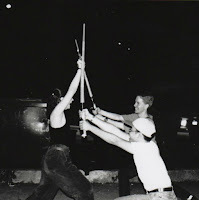 After more than 60 hours of sleeping, playing, and waiting patiently on the sidewalk outside, and taking their seats some 45 minutes before the program was scheduled to begin, members of the audience participated in mock light-saber battles in the area in front of the huge Cinerama screen. The slightest mention of Star Wars or its box-office champion nemesis, Titanic, elicited loud cheers or jeers. And the moment the words “Lucasfilm, Ltd.” appeared on the screen, the auditorium was consumed by hoots, hollers, whistles, footstomping, and applause. And how well-deserved this greeting was! The Phantom Menace is a tour de force of special effects. George Lucas, returning to the director’s chair for the first time since Episode 4: A New Hope of 1977, has given us a payoff for his long wait for technology to catch up to his imagination. Drawing upon the mythological traditions of Europe, the Middle East, and East Asia, Lucas has created a story with universal appeal. Using archetypes that have been found throughout literature since before man learned to write, Lucas shows us, quite literally, the stuff that dreams are made of. It is conventional in a review like this to resist revealing key plot developments and, in particular, the ending. So I will resist. But a few comments are in order. Young Anikan Skywalker (played by nine-year-old Jake Lloyd) is intelligent, humble, and helpful beyond words. He is easy to love. Yet, at the same time, because we know what happens in Episodes 4-6, we also know that he will become the evil Darth Vader. Thus it is with some ambivalence that the audience applauds when things go well for young Anikan. Is Lucas trying to mess with our minds? Is he trying to personalize this Manichean struggle between good and evil? Is he helping us to demonstrate for ourselves that each of us has within us, as Jewish tradition would put it, a good yetzer and an evil yetzer? Some have faulted this episode of Star Wars with being big on special effects and short on characterization. This may be true, so far as it goes, but one should also keep in mind that this episode is meant as an exposition, setting up a situation for a payoff that will happen later. Half of the fun is to look for clues and links to events and characters we already know from Episodes 4-6. We can count on fuller character development in Episodes 2 and 3. Still, The Phantom Menace stands on its own as an entertaining whole. One need not have seen any of the previous (later?) Star Wars films to enjoy this movie. The rest of the summer will no doubt be filled with Star Wars mania. Enjoy it while it lasts. The next film is not scheduled to be released until 2002. 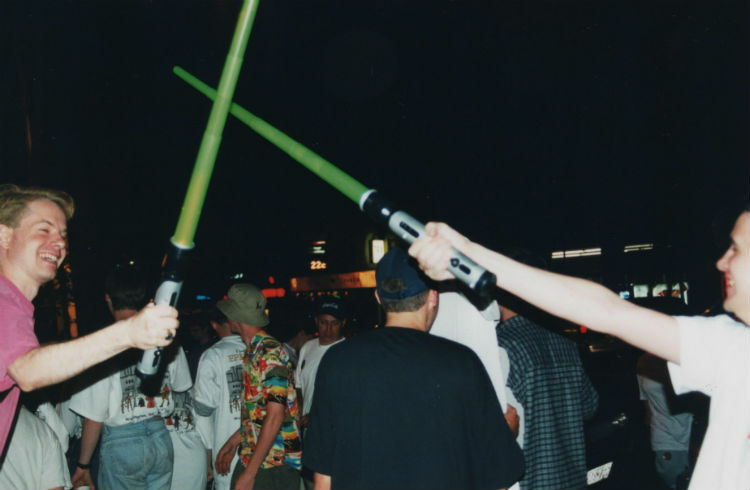 Seventeen years ago this month, I was among the hundreds of Star Wars fans who camped out in front of the Uptown Theatre in Northwest Washington, D.C., to wait for an opportunity to be the first to buy tickets and, the next week, to see the first screening, of Episode 1: The Phantom Menace. I also covered the gathering for The Metro Herald, which in succeeding weeks published my report on the sidewalk queue and my review of the movie. Star Wars Episode 1: The Phantom Menace is, without a doubt, the most anticipated movie in a generation, perhaps since Gone With the Wind. Some would argue that it is more hype than substance, though that remains to be seen, since the vast majority of us have seen only tantalizing snippets in the form of trailers, commercials, music videos, and computer files that end in *.AVI or *.MOV. For diehard Star Wars fans, however, this is a religious experience. They, like the rest of us, have been waiting for 16 years for the newest film in the series to be released. Yet their wait has not been casual. It has been intense, with the intensity growing in recent weeks as the magic date of May 19 approached. 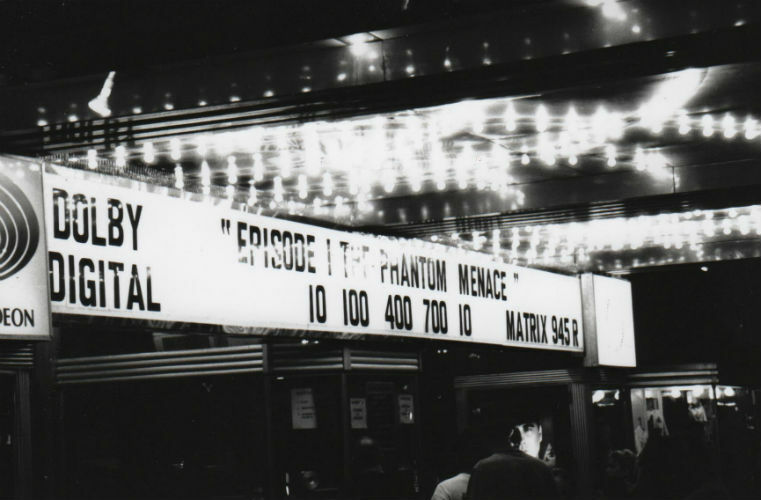 Starting last Sunday evening with a handful of dedicated fans, growing as a trickle through Monday night, until by Wednesday morning some 325 or more devotees had gathered on the sidewalks outside the Uptown Theatre on upper Connecticut Avenue in Northwest Washington. The line snaked along from the south edge of the theatre, past Starbucks and Ireland’s Four Provinces, past the Cleveland Park Public Library, all the way to the end of the bridge that carries the avenue over Rock Creek Park. There is no sense of crowdedness, certainly no rowdiness, but definitely a sense of hominess. The sidewalk is littered with sleeping bags, lawn chairs, coolers, pizza boxes, empty soda cans, knapsacks, and more. Some sit on inflatable furniture. (Inflatable Darth Maul chairs are available at Toys-R-Us for $21.95.) Some people have brought along radios and CD players. (The musical score from earlier Star Wars episodes floats through the air along with the chatter of fans.) For the overnight campers, there is the portable entertainment in the form of card games, Star Wars Trivial Pursuit sets, action figures, and plenty to read, from collections of “Bloom County” cartoon strips to J.R.R. Tolkien books to Douglas Adams’ Hitchhiker’s Guide to the Galaxy. The crowd is mostly young, primarily college students but some people in their thirties and some in their teens. Some come dressed in Star Wars-inspired costumes, but most are dressed simply in shorts and t-shirts, jeans and sweatshirts. As the sun rises across Connecticut Avenue, they rub sleep out of their eyes, wrapped so tightly in their sleeping bags that an unwary observer might think this gathering is for a re-release of Cocoon or The Revenge of the Pod People. But soon they emerge from their protective covers and begin socializing amiably with their neighbors. Despite the discomfort of sleeping on concrete overnight, the queue of fans is remarkably chipper so early in the morning. A palpable friendliness permeates the atmosphere. For so many people, the situation is quite calm, peaceful, and orderly. It provides an excellent example of economist Friedrich von Hayek’s “spontaneous order” – particularly appropriate since Hayek’s 100th birthday was celebrated on Saturday, May 8. An ad hoc community has been formed here, where once and future strangers watch out for one another as friends. Need a drink? Does nature call? Leave your things behind; no one will allow them to be pilfered. Everyone seems to get along. Oh, there might be an occasional light-saber fight, but only on the friendliest terms. And in the middle of the night, the whole gang played an elaborate game of “telephone,” with whispering that starts at one end and finishes up three blocks and three hundred people later. As people pull out their breakfasts – consisting of Mountain Dew, Doritos, potato chips, and chocolate bars – there is no hesitancy about sharing. Local businesses and radio stations have chipped in, too. They are passing out free doughnuts, and Ben & Jerry have brought a load of ice cream treats. The local media are here, of course. Fox News has a crew on hand all morning long, doing periodic live broadcasts throughout the network’s morning news show. The perky Fox correspondent, Holly Morris, gets the fans to play Trivial Pursuit with her, share their yummy breakfasts, and sing along to the Star Wars theme song (using lyrics invented by Bill Murray on Saturday Night Live more than 20 years ago, in his character of a smarmy Vegas lounge singer). Local radio stations are here en masse: WPGC; WASH 97.1 FM; WHFS; 104.7; Mix 107.3. They’re all passing out promotional materials – free CDs, flyers, T-shirts, various Star Wars souvenirs. They recognize a captive audience when they see one – and they get the fans to play along, too, putting them on the radio, live via cell phone. Cell phones are ubiquitous, too – a lifeline to home or work for those who have been absent for almost three days. Some troglodytes are still using the pay phones that dot the landscape, but these old-fashioned devices are far from necessary these days. As the sun rises higher in the sky, shirts come off and the aroma of suntan lotion wafts through the air. The anticipation grows stronger as zero hour – 2:30 PM is when tickets go on sale – approaches. Each person in line will be limited to buying 12 tickets, and all of them must be for a single performance. The most eagerly sought tickets are those for the first showing at 10:00 AM on Wednesday, May 19. Those who are purchasing them are already planning to camp out for the three nights preceding the show, simply so they can have first choice of the choicest seats. It becomes a never-ending story. Could such a gathering of people occur in the suburbs? It is hard to imagine hundreds of people camping out on the macadam outside a suburban multiplex for days at a time, with traffic zooming by on the surrounding four-lane highways. A barren parking lot lacks the vitality of a central city’s sidewalks. Star Wars fans, with their souls in another galaxy, far, far away, have their feet firmly on the ground in the most traditional of settings, the urban village. Next week: Reactions to the movie.